Investing in a quality patio umbrella for your home can be a very fulfilling experience. 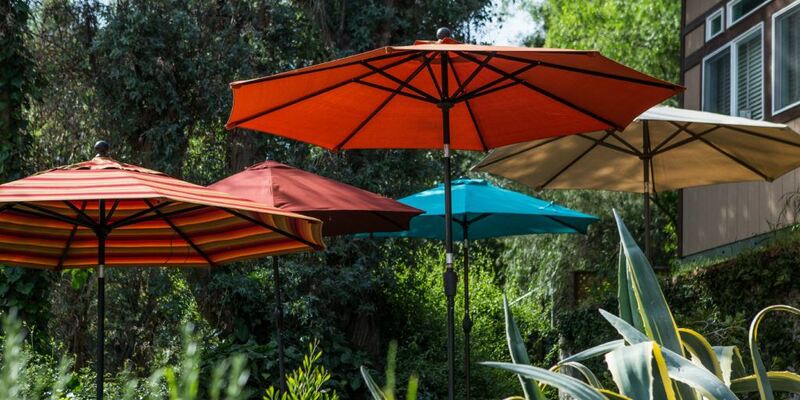 It’s more than just a backyard ornament, patio umbrellas are involved in countless precious memories and meaningful moments, spent with families and friends. So, if you’re planning to buy your next patio umbrella and are wondering about the size that’s appropriate for your desired location, read this ultimate size guide! A patio umbrella serves a unique purpose for your home’s outdoor atmosphere. You can use it for your garden, backyard, or patio to make it look beautiful, as well as for UV sun protection. Umbrellas can be made of different materials such as fiberglass, wood, and aluminum. Durable ribs and fancy waterproof canopies, in a variety of colors, shapes, and sizes, makes any patio appear more attractive. Buyers often get too excited upon purchasing a patio umbrella, based on the uniqueness of designs, patterns, shapes, textures, and colors. However, one of the most important features to consider when buying your next patio umbrella is its size. The size of your patio umbrella is truly vital to the overall appearance of your garden, backyard, or patio. Below are some practical and useful tips to consider. Consider the target location’s available space. Of course, any patio umbrella that you buy, will take up a fixed amount of space in your target location. So, it’s important to consider where you put your umbrella. A small patio umbrella for a very spacious garden will make the space appear awkward, unless you fill the gaps with many plants and other features. On the other hand, a large umbrella in a small backyard will appear too busy. The size of the umbrella that you choose for your patio umbrella could make or break your outdoor landscape. Pay attention to your table dimensions. Your patio umbrella must be able to totally cover your patio’s dining table. As a good rule of thumb, the canopy rim of your chosen patio umbrella should extend 1-2 feet beyond your table, on either side. So, if your table has a diameter of 6 feet, your umbrella should be at least 8 feet in diameter. Know the right umbrella size. There are many different patio umbrella sizes to suit your needs. If all you need is an umbrella to provide shade for an outdoor bar space, a 6 feet wide umbrella will do. If you need an umbrella to cover your bridge table, you most likely require an 8 feet wide umbrella. If you need an umbrella to cover a dining table, set for 4 people, your umbrella should be 10 feet wide. When you get the correct size of umbrella, you will have the perfect amount of shade for your desired activity. Take into account the seating capacity. While the standard rule of thumb is to measure your umbrella size, relative to your dining table size, it is worth noting that some seating arrangements will outsize any umbrella. There are a couple of solutions… If your seating requires a slightly larger umbrella, then you can consider elevating the umbrella to provide extra shade. If your seating takes up double the space, then buying an additional umbrella may be the only solution. You must get a patio umbrella that’s high enough for proper shade coverage. Usually, 8 feet high is sufficient to provide shade for your guests. Also, most guests aren’t much taller than 6 Feet, which is why an 8 Foot tall umbrella, provides enough gap for them to walk around freely. Get the size of the base. Your patio umbrella’s base plays a big role in your umbrella’s stability. The heavier the patio umbrella’s base, the better it will be at keeping your umbrella standing upright, even amidst high winds. key factors to consider when picking out your patio umbrella’s base is the placement of the umbrella, the type of umbrella, and how windy your location is. If your patio umbrella free-standing one, you will likely need a heavier base, however if it is in a table, a heavy base is much less important. If your patio umbrella is made of lightweight materials, like aluminum, you will require a heavier base compared to fiberglass poles. The windier your area is, the heavier your patio umbrella base should be. Small 6 Feet patio umbrellas need, at least a 20 pound base. Medium 8 Feet umbrellas need, at least a 40 pound base. Large 10 Feet umbrellas need, at least a 70 pound base. Consider the umbrella’s pole diameter. The heavier the materials used in the ribs and canopy of your patio umbrella, the greater the pole diameter must be. Every manufacturer builds their umbrellas according to their own designs and specifications, and tests the ability of the umbrella to withstand winds. As such, the diameter will vary, however most high quality umbrellas can withstand winds up to 30KM/H. Study the patio umbrella’s mechanics. There are many patio umbrellas available on the market today. These include traditional models, as well as the more recent and sophisticated push-buttons models. Traditional mechanics employ crank-only systems for opening and closing the umbrella. Newer types of patio umbrellas include the push-button feature, allowing you to also angle your shade. The newer models are made for superior functionality. Choose the right shape for your patio umbrella. There are a variety of patio umbrella shapes available for you to purchase. You can choose round, square, or even irregular shapes, whatever best suits your needs. It is wise to consider the shape of your patio umbrella to maximize your shade. If you are working with a smaller space, a square shape can usually fit better for superior shade, however if you have plentiful space, a round shape can look beautiful, as well as provide significant shade. Buying a patio umbrella for your exterior living space adds a beautiful flair to your usual garden, backyard, or patio landscape, and a patio umbrella is a must-have for every home that is open to guests. You also want to have a good idea of the specs needed for your umbrella before making a purchase. Hopefully, you are able to pick the perfect patio umbrella following these helpful tips!